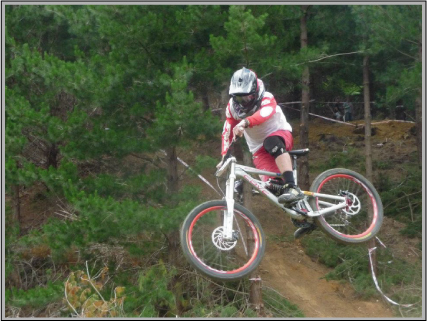 Round 5 of the NZDH series was held in Dome Valley – Warkworth ( North of Auckland ) over the weekend. With the threat of rain for the weekend and the event venue being at the North end of the country, rider participants were well down. 72 Riders registered for the weekend with the Saturday Practice day holding the much discussed timed race run’s late in the afternoon. Pro Elite Winner: AKDH – Sam Baker. Considering rain had been forecasted for both practice and race days for Dome Valley, Saturdays weather was perfect! The riders we greeted with a well prepared race track with some very cool new features added in preparation for Round 5 of the NZDH series. A brand new start ramp, then a newly formed step up 9 metre gap jump and then for the approach to the finish line area, a new well planned step up jump leading into a nice right-left hand berm section of which led into the final downhill run to the big finish line jump. The practice day once again went very smooth throughout, the riders were finding the Dome Valley track conditions just a little tacky in places to start with of which then quickly turning into perfect conditions for all riders being able to have a whole lot of fun in preparation for race runs late in the afternoon. The NZDH committee had been previously discussing possibilities during the week of holding timed race runs on the Saturday afternoon practice day in the event of a possible Race day cancelation. It was decided and announced to all riders during practice session that NZDH will be staging x 2 timed race runs at 3.30pm that afternoon due to the possible threat of tomorrow’s race day being rained out. The decision was mostly well received amongst the competitors as the practice day track conditions were perfect. After a late lunch break, Riders prepared themselves for the new afternoon format and the first rider shuttles left for the top of the track at 3.30pm. The Women’s open class were the first class to start the afternoons racing, great to see 3 International competitors competing in this class over the weekend and also to see local AKDH rider Sophie Marie Bethel competing for the 1st time since competing at the UCI World Champs back in September of this year. Sophie took the first run race win over another local Women rider Adrienne Hooper with the two International German riders close behind. Next up were the Masters men who had the privilege of local rider Nick Skeates competing over the weekend and was looking dangerously quick throughout practice. Liam O’Ryan took out the 1st race run with Nick coming in a 1 second behind… “trouble was brewing” here for the following Masters Men race run. The usual tightly contested U15 class also had the local AKDH Jonathon Kennett added into the mix of which promptly stomped his authority with a massive 10sec advantage over the next rider for the 1st timed run. A battle was also in place for two of the leading series competitors Jack Humphries and Matt Lawton, Matt on his last chance to try and square up the points tally with his friendly rival by needing to take the advantage over Jack for the weekend to try and claim 1st equal overall for the series. A bit of hiccup with a flat tyre caused Jack Humphries not to appear at the finish line for his 1st race run, made for what turned out to be an exciting finish for the Under 15 squad in the 2nd race run. Zeroed rider Lawrence Cawte had his work cut out in the Under 17’s class to keep the newly revived AKDH Kurt Summerfield at bay, Kurt finally finding his usual race pace after breaking his leg at the National Champs in Dunedin at the beginning of the year. Lawrence taking the top slot with Kurt coming in with a close 2nd place. The Under 19 class was also hotly contested with the usual Louis Hamilton, Jay Barrett battle with Jay taking out the 1st race run win. Local AKDH Senior men rider Jonathon Andrews was missing his NZDH series rival Carl Edmondson over the weekend of which Jonathan took a 4sec lead over Ryan Lewis for his efforts for the weekend. The popular Pro Elite class was missing series leader Matt Walker for the weekend, so it was all up to local AKDH rider Sam Baker to try and spoil the International Hawkes Bay duo of George Brannigan and Red Bull rider Brook Macdonald by mixing it up for the final results for the weekend. The 1st race run proved that Sam Baker was definably on a mission coming in with a close 2nd place finish behind the “ever so smooth” George Brannigan and ahead of Brook Macdonald. The final race runs were averaging out quite a bit faster which proved that all riders were enjoying the perfect track conditions. Women’s Open class AKDH riders Sophie Marie Bethel and Adrienne Hooper taking 1st and 2nd place for the class. Masters Men AKDH rider Nick Skeates laid down the run he was looking for with a 4sec win over Liam O’Ryan to take out the top spot for the weekend. The U15 series battle between Jack Humphries and Matt Lawton ended up with Jack taking 1st place by 0.5sec over Matt which has sealed the overall for Jack Humphries to take out the U15 Series overall, Well done Jack! U17 NZDH Series Champ Lawrence Cawte once again took the top spot with Kurt Summerfield taking 2nd place. Louis Hamilton turned around the 1st race run results with taking out the fastest time of the class over Jay Barrett for the weekend. The final Pro Elite class event was a huge battle between the top three with an outstanding win for Sam Baker over George Brannigan and Brook Macdonald, also good to see Aari Barrett coming in closer to the mix with the top 3. A very quick decision after a 2 hour practice session, the forecasted rain started to fall and by 12.00 o’clock the days racing had been cancelled. The previous day’s final race runs were a good call in the end and the results were counted for Round 5 of the NZDH Series. Overall, another great weekend of racing, a big thanks to Auckland Downhill ( AKDH ) for holding another great event and being supportive with running the main event on Saturday afternoon. Look forward to seeing everyone in Tauranga on the 28-29th December for the final round!! This entry was posted on Thursday, December 8th, 2011 at 7:34 am and is filed under Uncategorized. You can follow any responses to this entry through the RSS 2.0 feed. Both comments and pings are currently closed.